Sky has launched a new promotional tool on Freeview to advertise its internet based TV service Now TV. Using a new red button service associated with its free-to-air channel Pick on Freeview channel 11, Sky is inviting viewers to find out more about the service, which offers access to Sky's main entertainment, sports and film channels. The service provides basic information about the service and its current programme highlights. Testing by a516digital on an internet streaming compatible TV shows two slightly different versions of the red button service being served, depending on if the TV is connected to the internet. It doesn't appear on all TVs. 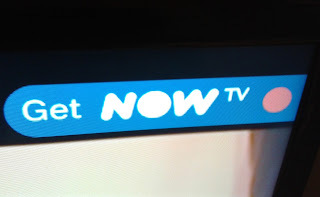 Viewers are directed to a special portal page on the Now TV website (www.nowtv.com/picktv) to sign-up. Pick is no stranger to cross-promotion; Sky has used its free-to-air entertainment channel for special Sky freebies in the past, including Sky Thursdays in 2013 and one-off Sky Sports free days, which were used to promote Sky's entertainment and sports programming. But this is the first time Sky is effectively serving a round-the-clock advert on Pick.